I'm afraid that my moth lethargy continues for the time being, with my trap bulb broken and rather a lot of other projects on the go. But Penny enlivened our cosy evening tonight with a cry of "Moth!" and there on the kitchen window - outside- was my very first record for 2015: a Dotted Border. Here's its underside too. It clearly liked our kitchen since the first sighting was at 7pm, just before the latest dramas in the ever more frantic The Archers, and it's still here at 9pm, dozing away while we get ready for Wolf Hall. By a happy coincidence, the Dotted Border was one of my first moths last year too, and features on the blog for this very Wednesday in February twelve months ago. Hello for the first time in 2015 - and apologies for the inertia here. Life's been busy, the weather hardly conducive to mothy excitement and, most significant, my bulb went, possibly after sterling work as a Christmas bauble (see previous post). I'm not in any hurry to get going, as it happens, with reports on the sterling Upper Thames Moths blog pretty sparse since Christmas, and the mornings only just beginning to get light enough to tempt me out of doors at the earlyish hour which trap inspection requires. However, I will get myself sorted to email Watkins & Doncaster for a new mercury vapour bulb and probably start operations in early March. 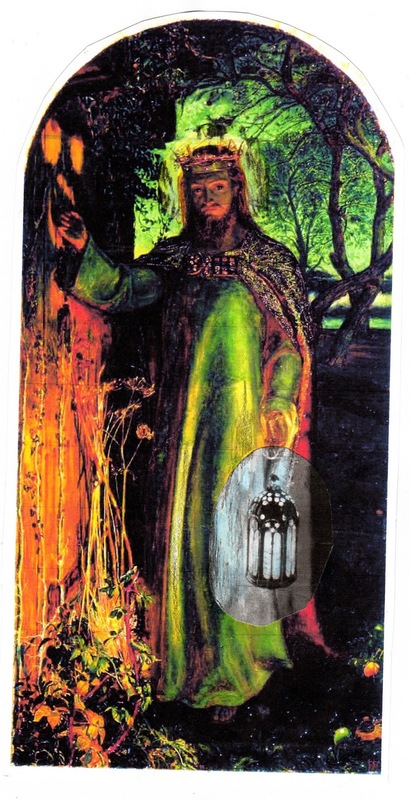 Meanwhile I was mulling over my situation and Holman Hunt's painting The Light of the World, which hangs just down the road in Keble College, Oxford, floated into my mind. Via the wonders of modern technology I have adjusted it to show how things feel here. I also adjusted the halo, since I do not deserve one of those.